Background The association between match congestion and injury rates in professional football has yielded conflicting results. Aim To analyse associations between match congestion on an individual player level and injury rates during professional football matches. Methods Data from a prospective cohort study of professional football with 133 170 match observations were analysed with Poisson regressions. Associations between short-term match congestion, defined as number of days between two match exposures (≤3, 4, 5, 6 and 7–10 days) and injury rates were analysed. To analyse the influence of long-term match congestion, defined as individual match exposure hours in the 30 days preceding a match, observations were categorised into three groups (low, ≤4.5; medium, >4.5 to ≤7.5; and high, >7.5 hours). Results No differences in total match injury rates were found between the reference category (≤3 days) and the other categories of short-term congestion. Muscle injury rates were significantly lower in matches preceded by 6 (rate ratio (RR) 0.79; 95% CI 0.65 to 0.95) or 7–10 days (RR 0.81; 95% CI 0.71 to 0.93) compared with ≤3 days since the last match exposure. No differences in total and muscle injury rates between the three long-term match congestion groups were found. Conclusions In this study of male professional football players, there were no match congestion-related differences in total match injury rates, but muscle injury rates during matches were lower when players were given at least 6 days between their match exposures. Professional football carries a high risk of injury, with muscle injuries being the most common injury type.1 Muscular fatigue, defined as a decline in muscle performance associated with muscle activity,2 and signs of muscle damage may last more than 72 hours after a football match.3–6 Players may also experience mental fatigue following a match,7 with decreasing decision-making abilities as a possible consequence.8 Almost one-third of matches for top-level professional football teams are played within a 72-hour interval.9 It is therefore plausible that players are not able to fully recover, physiologically and/or mentally, between matches. Studies focused on short-term match congestion have shown that injury rates are higher if a team plays two matches separated by 4 or fewer compared with 6 or more days;9 10 in particular, muscle injury rates increase with fewer days between matches.9 Long-term match congestion has also been investigated in a few studies. While most of these studies have shown associations between match congestion and high injury rates,9 11 12 one study reported no such association.13 Even though these studies have provided important initial information about the relationship between injuries and match congestion in professional football, they have been limited by either small sample sizes or by analysing match congestion at the team level. Furthermore, the combined effect of short-term and long-term match congestion on injury rates has not been investigated in football. The aim of the present study was to analyse associations between match congestion and match injury rates at an individual player level. A secondary aim was to analyse whether associations between short-term match congestion and match injury rates are dependent on the player’s long-term match congestion. This study was based on post hoc analyses of data gathered during 14 consecutive seasons from 2001/02 to 2014/15 in a prospective cohort study known as the UEFA Elite Club Injury Study.1 During this period, a total of 57 professional European teams from 16 countries were included, all participating in the highest division of their respective countries. All first team players from the included teams were invited to participate for a total of 2672 included players. Two different variables were used to study the influence of short-term and long-term match congestion on injury rates during football matches. Short-term match congestion was defined as the number of days that had elapsed since the player’s last recorded match exposure prior to an observation (eg, if a player played a match on Monday and then played another match on Thursday, 3 days had elapsed before the second match). Long-term match congestion was defined as the total hours of match exposure that the player had been exposed to in the past 30 days prior to an observation (table 1). First team and national team competitive match observations (excluding first team friendly, reserve team and under-21 team matches) that were preceded by at least 30 days of reported exposure not interrupted by any occurring injury or absence due to injury were considered eligible for analysis. In addition, there should not have been more than 10 days between an observation and the players’ last preceding match. All statistical analyses were performed using the Statistical Package for the Social Sciences 23 (SPSS, Chicago, Illinois, USA). Injury rate was defined as the number of injuries per 1000 hours of match exposure. Match injury rates in different short-term match congestion groups (categorised as ≤3 days, 4 days, 5 days, 6 days, and 7–10 days between matches) and rate ratios (RRs) between these groups were analysed with Poisson regressions using match exposure hours as an offset. In these analyses, short-term match congestion was included as the independent variable, with ≤3 days serving as the reference category, while number of injuries and muscle injuries were used as dependent variables in separate analyses. To investigate the influence of the duration of the previous match exposure, all observations were categorised in two groups (<90 min or ≥90 min of exposure in previous match) which were analysed separately. Additional analyses were made for those observations where the duration of the previous match exposure was ≥90 min. First, to analyse associations between long-term match congestion and injury rates, observations were categorised in low (≤4.5 hours), medium (>4.5 to ≤7.5 hours) or high (>7.5 hours) match congestion groups. These cut-offs were chosen in conjunction to the number of full match exposures (1.5 hours/full match) that were closest to the 25th percentiles. General and muscle injury rates in these groups and RRs between the groups were analysed with Poisson regressions using match exposure hours as an offset. In these analyses, long-term match congestion was included as the independent variable, with high (>7.5 hours) serving as reference category, while number of injuries and muscle injuries were used as dependent variables in separate analyses. Second, to investigate whether associations between short-term match congestion and muscle injury rates during matches were dependent on long-term match congestion, these associations were analysed in each of the long-term match congestion groups separately. Third, associations between short-term match congestion and injury rate to specific muscle groups (hip/groin, thigh and lower leg) were analysed. These analyses were also made with Poisson regressions including short-term match congestion as the independent variable, with ≤3 days serving as the reference category, and using match exposure hours as an offset. All results are presented with RRs including 95% CI. All tests were 2-sided, and the significance level was set at p<0.05. A total of 133 170 individual match observations were included in the analyses adding up to a total of 166 433 match hours. During this match exposure, 4083 injuries were reported including 1561 muscle injuries (table 2). This yielded a total injury rate of 24.5/1000 match hours and a muscle injury rate of 9.4 injuries/1000 match hours. There were no associations between total match injury rates and short-term match congestion. Muscle injury rates were 21% lower when there were 6 days, and 19% lower when there were 7–10 days compared with when there were ≤3 days between matches. However, no differences were found when matches were separated by 4 or 5 days compared with ≤3 (table 2 and figure 1). Analysis of the association between short-term match congestion and injury rates. Injury rate (injuries/1000 hours) ratios with corresponding 95% confidence intervals (CI) are presented using ≤3 days between matches as reference category. Rate ratio > 1.0 indicates a higher injury incidence. Rate ratio < 1.0 indicates lower injury incidence. Significant difference is present if CIs do not include 1.0. When the observations were grouped based on the duration of the previous match exposure (<90 min and ≥90 min), similar RRs, with 18%–22% fewer muscle injuries when matches were separated by 6 or 7–10 days compared with ≤3, were shown in both groups. However, these differences were significant only if the duration of the previous exposure had been ≥90 min. In addition, a significant 37% reduction in muscle injury rate were shown if matches were separated by 5 days compared with 3 or less if the duration of the previous match exposure were <90 min (table 2). No differences between general or muscle injury rates were shown when ≤4.5 hours or >4.5 to ≤7.5 hours were compared with >7.5 hours (table 3). When association between short-term match congestion and muscle injury rates was analysed separately in these groups, similar RRs were observed with 17%–31% lower muscle injury rates when there were 6 and 7–10 days between matches compared with ≤3 days in all long-term match congestion groups. These differences were, however, not significant except for when 7–10 days was compared with ≤3 days in the medium long-term match congestion group (table 3 and figure 2). Analysis of the association between short-term match congestion and muscle injury rates in groups based on long-term match congestion. Injury rate (injuries/1000 hours) ratios with corresponding 95% confidence intervals (CI) are presented using ≤3 days between matches as the reference category. Rate ratio > 1.0 indicates higher injury incidence. Rate ratio < 1.0 indicates lower injury incidence. Significant difference is present if CIs do not include 1.0. Hip/groin, thigh and lower leg muscle injuries were analysed separately in match observations where the duration of the previous match exposure was ≥90 min. These analyses showed similar patterns for hip/groin and thigh injuries with 18%–22% fewer injuries when matches were separated by 6 or 7–10 days compared with ≤3. These differences were, however, not statistically significant. Non-significantly fewer lower leg injuries were also shown when there were 6 or 7–10 days between matches compared with ≤3. This reduction was larger than for other muscle groups after 6 days (33%) while it was smaller after 7–10 days (13%). In addition, statistically significant more hip/groin muscle injuries were observed when matches were separated by 5 days compared with ≤3 (table 4). The main finding of the current study involving more than 130 000 match observations was that the risk for professional football players to experience a muscle injury during a match was significantly associated with short-term match congestion. If players were allowed 6 or 7–10 days between their match exposures, the muscle injury rate was about 20% lower than if they had ≤3 days. Similar, but non-significant, RRs following 6 days or 7–10 days between matches were shown for hip/groin, thigh and lower leg muscle injuries. This is highly relevant for all medical practitioners working in professional football, and is in line with most previous studies in the field.9–12 Although the associations between match congestion and injury rates were found to be statistically significant it should be acknowledged that the individual player is still unlikely to suffer an injury in a given match even when facing a congested match schedule. In addition, there were no differences in injury rates in matches that were played ≤3 days after a previous match exposure compared with 4 or even 5 days. This finding is interesting since a rule change, which would allow teams to have at least 4 days to recover between their matches, has recently been suggested.15 The main argument for introducing such a rule is that it could potentially reduce injuries in the sport, but the current study suggests that a 4th day between matches would have limited impact on injury rates in professional football. One possibility for teams to reduce short-term match congestion for their players is a planned player rotation strategy. The analyses of players who had less than 90 min of exposure in their previous match showed that they had fewer muscle injuries when matches were separated by 5 days compared with 3 while there were no differences in injury rates after 5 compared with 3 days for players who had 90 min or more exposure in their previous match. This finding will offer some support that teams could potentially reduce the effect of short-term match congestion with the use of player rotation and substitutions. A possible mechanism explaining the higher match muscle injury rates during periods of match congestion is remaining muscular fatigue following a match. Signs of muscular fatigue after a football match or similar physical activity have been shown to remain for up to 72 hours in several studies.3–6 These studies have all shown significant effects on muscle performance throughout 72 hours of recovery after a match. In addition, objective signs of muscle damage and inflammatory reaction,3–6 as well as higher subjective ratings of muscle soreness,5 6 have also been demonstrated. Studies have also shown that the biomechanical properties of muscles may change during and immediately after a match-simulating exercise resulting in lower maximum force production, lower muscle torque rate and changes in muscle activation patterns.19–22 These changes may alter player movements, subjecting specific muscles to activity levels/patterns that they are not accustomed to and thereby exposing players to higher injury risk. It is, however, not known how long it takes for these factors to return to preactivity levels. In football, studies have indicated that mental fatigue decreases the decision-making ability of players in match play situations,8 as well as their physical and technical performance immediately after completing a mentally fatiguing exercise.24 It is plausible that a player with reduced decision-making abilities as well as physical and technical abilities will face more high-risk situations during a match such as receiving a tackle or being forced to sprint. There are, however, no studies on the development of mental fatigue following a match and during the subsequent recovery period and no studies investigating mental fatigue during a period of match congestion. In addition, when match observations were separated into low, medium and high long-term match congestion groups, similar RRs, with lower muscle injury rates after 6 or more days since the last match exposure compared with less, emerged in all groups. This indicates that the associations between short-term match congestion and muscle injury rates were not dependent on players’ long-term match congestion. The study finds merit in that it follows international consensus about how to conduct epidemiological studies in football. The major strength is the large and homogenous cohort of professional football teams from several countries, with more than 130 000 individual match observations, which allows for a more detailed categorisation of the different match congestion variables than those in previous studies.10–13 It should, however, be acknowledged that even though the study included a large cohort, there were still relatively few injuries included in some groups in the subanalyses and the findings from these should therefore be interpreted with caution. The fact that most of the RRs in these subanalyses were found to be non-significant may also suggest a lack of statistical power. A second limitation with the study is that the load during training sessions was not measured. In addition, match congestion, as used in the current study, only measures the interval with which matches were played and does not take into account the activity level of players during these matches. There are several factors that may influence the activity level of players during matches. Previous studies have, for example, shown that playing formation, possession of the ball and the current score line of the match will influence players’ activity level.26–28 It is reasonable to believe that players’ activity level during match-free days as well as their activity level during specific matches might contribute to their level of fatigue, which could potentially be of importance for their injury risk. It should also be acknowledged that match-related factors that influence the activity profile of participating players as discussed above, and which have not been taken into consideration in the present study, may also have a direct effect on the risk of sustaining an injury during a match exposure. Furthermore, only external load (the amount of work performed by the athlete) was considered,29 while internal load (relative physiological and psychological stress imposed on the athlete) was not included. A concern with measurements of external load is that they may only measure specific aspects of the load that athletes are exposed to, that is, match congestion in the current study. However, internal load measures are also needed to capture the full picture of the load put on athletes and how they react to this load. This issue is supported by data from cricket where measurements of internal load have been shown to be a better predictor of injuries than external load.30 Studies with more detailed information of the activity level during all training sessions as well as matches, and with a focus on the internal load might therefore be able to contribute further to the understanding of how load is associated with injury rates in professional football. Finally, observational studies are always at risk of confounding factors. In the present study, some possible confounders have been considered by several separate analyses of different subgroups based on previous exposures. However, the risk of remaining confounders should not be disregarded. One possible confounder is that the selection of players before matches may be influenced by the short-term match congestion. This would mean that there, to some extent, could be different players included in the different short-term match congestion groups that were analysed which could potentially influence the results. A second possible confounder is that players’ long-term match congestion could be influenced by a previous injury. Even though we used an exclusion criteria saying that players could not have been absent due to injury during the last 30 days prior to a match, it is still possible that an injury absence prior to those 30 days could affect players’ long-term match congestion. It is plausible that players who have recently been absent due to injury would have lower long-term match congestion compared with players who have not been previously injured. A previous injury is an established risk factor for sustaining a secondary injury31 and previous injuries could thus potentially influence our results. In this study of male professional football players, there were no match congestion-related differences in total match injury rates, but muscle injury rates during matches were lower when players were given at least 6 days between their match exposures. There were no differences in total injury rates depending on the number of days separating two matches. 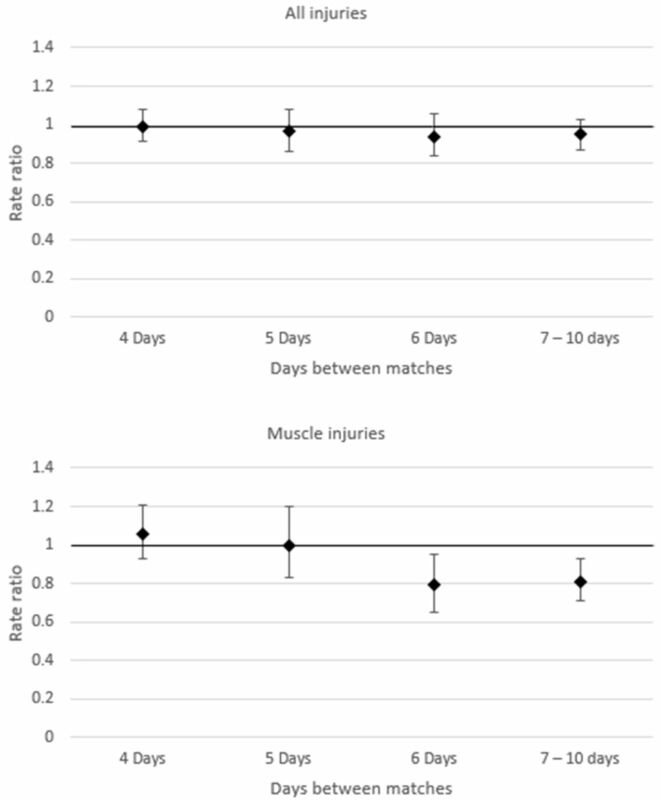 Muscle injury rates were lower after ≥6 days between matches compared with ≤3 days. There were no differences in total or muscle injury rates depending on players’ long-term match congestion. These findings may help guide technical staff in football teams when making decisions about players’ match congestion suggesting that player rotation may be of importance to avoid injuries even when matches are separated by 5 days. Remaining effects of a football match needs to be considered and monitored, and possible recovery strategies may be of importance up to 6 days following a match. The authors would like to thank the participating clubs (including contact persons, coaching staff, medical staff and all players) for their participation in the study. The authors would also like to thank Henrik Magnusson (HM) for insightful comments and help with statistical analyses. The Football Research Group is established in Linköping, Sweden, in collaboration with Linköping University and through grants from the Union of European Football Associations, Swedish Football Association, Football Association Premier League Limited and Swedish National Centre for Research in Sports.
. Study on recovery days: World Football Academy, 2012. http://worldfootballacademy.com/wp-content/uploads/2012/05/WFA_Study-on-recovery-days.pdf (accessed 8 Sep 2016).
. Monitoring athletes through self-report: factors influencing implementation. J Sports Sci Med 2015;14:137–46. Contributors HB was responsible for the conception and design of the study. HB and HM conducted the analyses, which were planned and checked with MH, JE and MW. All authors contributed to the interpretation of the findings and had full access to all data. HB wrote the first draft of the paper, which was critically revised by JE, MW and MH. The final manuscript was approved by all authors. MH is the study guarantor. Funding This study was funded by grants from the Union of European Football Associations and the Swedish National Centre for Research in Sports. Ethics approval The study protocol was approved by the UEFA Football Development Division and the UEFA Medical Committee.